Innokin Axiom Subohm Tank is Ultra compact tank with maxim 3.5ml capacity. With triple adjustable AFC intake and RBA single & dual coil option. Two colors for your choice: black and silver. 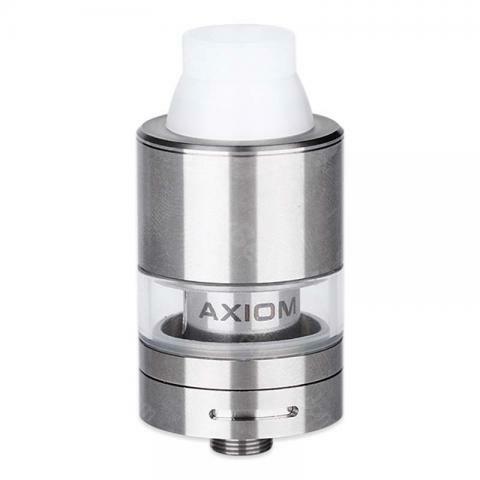 As a perfect design by Innokin, Axiom Subohm Tank is a typical Ultra compact 22mm tank with maxim 3.5ml e-liquid capacity and Integrated top filling. With triple adjustable AFC intake and RBA single & dual coil option, you can choose your own coils, and brings you a special flavor. Stainless Steel & Pyrex Glass design makes this device more popular. Here are two colors for your choice: black and silver. • Add e-Liquid into the reservoir. Do not overfill. • Twist the top cap on securely. Add approximately 3 - 5 drops of e-juice directly onto the cotton; wait 1 minute before vaping. • Carefully unscrew the tank base from the tank body. • Hold and unscrew the coil from tank base. • Replace with new coil. • Prime new coil with e-juice when mounted. • Carefully screw the tank body and base. • Fill tank with juice and then enjoy! • Unscrew the tank base from the tank body. • Carefully screw RBA coil onto tank base. • Unscrew RBA chimney from base of RBA. I rated it based on its class. This is a very nice compact tank. Better than I expected. I bought it to use on very small mods and I was expecting modest performance. I have a few very excellent tanks like the Troll, Boreas V2, and Intake, so I wasn’t expecting it to be in that class. The airflow is very good and the juice capacity. The small deck is fidgety to work with; especially with me installing small clapton coils. The first build worked perfectly and I was surprised how well it works. I’ve vaped a few tankfulls and no leaking. I’m using it at about 35 to 40 watts. The flavor is not bad at all. The short integral tip takes getting used to, but I have no issue with it. I tried a 510 tip, but as expected, the flavor dropped off some. On design, the deck posts are also a partition between the coils, which in my experience gives better flavor in all tanks I have with this feature. If you want a compact tank, this is a great choice. Super Tank, I bought it with the smoant mod together, arrived fast. I tried 0.5ohm coil first, big vapor, feel amazing.